Abstract: With the birth of Airwheel intelligent self-balancing scooter A3, our placid scooter market finally met its water bloom. Many people who love scooters couldn't wait to have a try to ride it. Airwheel A3 was one of them. A3, drawing numerous spotlights, was first came out on the stage of the new product conference. 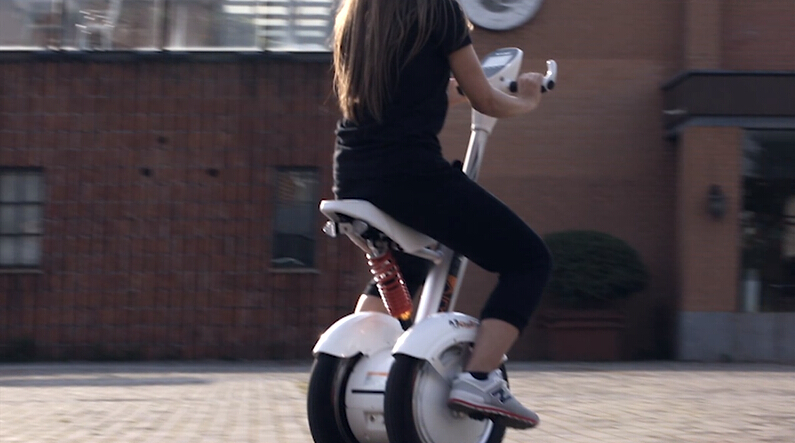 One of the most outstanding highlights of A3 self-balancing scooters is the adopted sitting-posture element. Intelligent balancing A3 offers riders a comfortable leather saddle. When riders ride the electric scooter, they can sit on the saddle, put their feet on the stainless steel pedals and put their hands on the silica gel handlebars. Even riding for long time, riders will not feel too weary. Most previously-released scooters adopt only standing-posture riding mode. Therefore, long-distance riding will often incur fatigue. Henceforth, with the release of Airwheel A3, this problem will be solved. Insisting on 450 W Sony lithium-ion battery, A3 still possess a sound power capacity and a longstanding range. In the condition of full charge, the range of A3 can reach 40-50 km. Therefore, it allows riders to have long-distance trip in the city. It is tested that A3 runs 50 km at the expense of only 1 kWh. In other words, the rider only needs to pay 0.5 euro to finish this 40 km trip because of its high performance. A3 will probably become a trend leader in scooter sector owing to its convenience, affordability and environmental benefit. Perfect as A3 electric self-balancing scooter may sound, consumers still hold some qualms about the vehicle that it might be powered off out of sudden during the ride. But A3 has special treatment for the electricity blackout. First of all, Sony lithium-ion battery provides A3 with a strong power capacity, which satisfies the need of a long-distance trip. The function of low-battery protection will monitor the real-time electricity state. Secondly, as a worldwide famous smart car-producing frim, Tesla aims to accelerate the development of outdoor power storage device. Therefore, an outdoor quick charge device will be invented in the near future. All in all, A3 will have a bright future. As an innovative and pioneering product in the market, A3’s significance remains to be seen. So it does. Let’s welcome this new and promising era. Previous：Airwheel S5 2-wheeled electric scooter: Why Using 16-inch Jumbo Tyres?